The success of Trade Route Mall can be attributed to a number of factors. The Owner-Developers believe strongly in giving back to the community. Their generosity extends to the development of the Nishtara Alcohol & Drug Rehabilitation Centre, as well as the exclusive use of 3,000m² of ground for the development of the Ahmed Kathtrada Foundation, as well as providing an ambulance to the community. A percentage of the parking revenue will be managed carefully and set aside for specific selected Charities. Trade Route Mall will select various types to try support every type of need. The Kids4Kids logo appearing on the artwork is our very own Kids Foundation. All CSI Projects go hand in hand, all contributions will be going to the Kids4Kids Foundation. This will be a monthly running Project. Successful Brands and Companies will also be approached to come on board to assist in supporting various Charities. 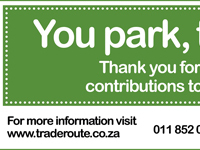 This is a proud Trade Route Mall initiative.